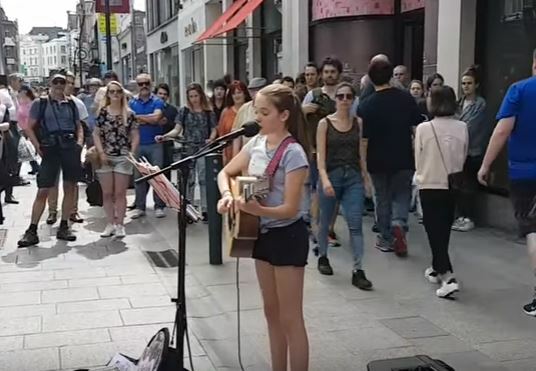 A 12-year-old girl named Allie Sherlock is a phenomenal guitarist and thanks to one video — she’s gaining worldwide attention. Her street performance of Ed Sheeran’s “Supermarket Flowers” will knock you off your feet. Back in June, Allie uploaded the video of her performing the pop artist’s song and it immediately went viral. The internet completely fell in love with the 12-year-old Irish girl. Her talent was incredible. As she starts singing the beautiful lyrics, “I took the supermarket flowers from the windowsill; I threw the day-old tea from the cup. Packed up the photo album Matthew had made, memories of a life that’s been loved,” her voice is mature beyond her years. Not only is her voice absolutely magical, she’s playing the acoustic guitar flawlessly. It’s hard to believe that she is only 12-years-old. There’s no doubt that this pre-teen is an old soul. Allie often performs on Grafton Street in Ireland but this particular video was going to change her life. It even caught the attention of Ellen Degeneres! Little wonder she has attracted such a crowd. Brilliant at such a young age! Sorry. Not for me. Prefer Ed. All the wannabe stars have a sob story to tell about their troubled childhood…..
And your point is ?? My point is that I think they use their unfortunate childhood to try and win a sympathy vote. As in, maybe the voice isn’t all that special, but she was bullied as a child bless her. I was unaware she was bullied at home until I read this comment and I thought she was ****** amazing. I needed no sob story to see how good she is! Good on her ! Stacey C Carter check her out! So good. I’m a huge Ed Sheeran fan and I think he would love this. She’s incredible. Awesome voice sign her up. Fantastic. For one so ypung. As a woman of Irish Decent, it makes me swell with pride. To all those saying “sorry prefer Ed”….. why are you comparing? She’s not looking to replace, just doing her thing! A bit of credit where it’s due please. Such a strong voice! Beautiful! Wow! What an amazing voice! Awsome job. I love buskers much better than pan handlers. Beautiful voice but I don’t like the way it is put in the news. No one sings an ed song like ed and this song in particular because of its meaning completely loses its meaning with her singing it. And what is the meaning?? Wow! What an amazing talented young girl! Chris Green show Beth this video fantastic talent !! I can’t get it to work??? What a voice. I agree with her dad, let her be a teenager first. Though never forget that you can sing and play a guitar. When Edd. Hears this he will agree how good you are.